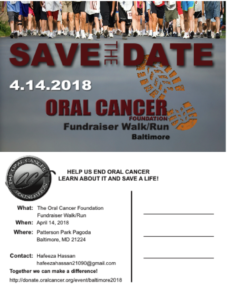 On April 14, 2018 the Student National Dental Association at the University of Maryland School of Dentistry will host our 9th Annual Oral Cancer Walk. We partner with the Oral Cancer Foundation to help give oral cancer a voice. Community Hospital Cancer Care Center's Annual Oral Head and Neck Cancer Screening. This will be our 4th year hosting screening events at the University of Miami. The fairs are organized but the medical students and the faculty and residents help screen participants at the fairs. This year we are hosting 6 screening events throughout OHANCAW. Three of the events will take place on campus and 3 will. 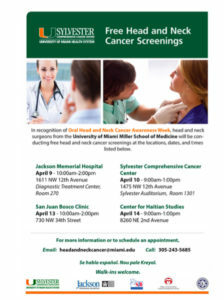 Free screening event for head and neck cancer. Do you smoke or chew tobacco? Are you concerned about the amount of alcohol you drink? Is your throat or mouth sore? Do you have hoarseness that won’t go away? Trouble swallowing food? Or a lump in your neck? Any of these problems could be signs of throat cancer. Throat cancer can be treated if. We will have a tent set up at the Natchitoches Jazz Festival on the downtown riverbank and two of our local physicians, Dr. Alex Hnatov, Radiation Oncologist and Dr. Lauren Anderson, ENT, will be performing the screenings. There is no need to register ahead of time, just come downtown to enjoy the festivities of the. 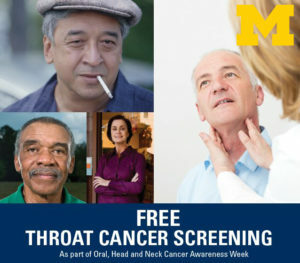 Henry Ford Health System's Department of Otolaryngology is holding a free cancer screening at Twelve Oaks Mall to promote awareness and education which will empower patients to detect early signs of head and neck cancers.